As unique as the individuals who carry them! 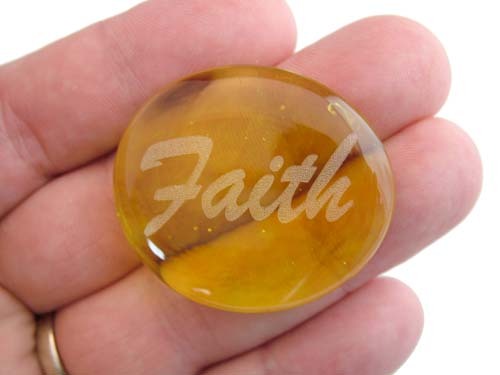 Practically any word, phrase, logo, or symbol can be laser engraved into our pocket sized, glass Word Stones. Choose from our vast selection of stock words or specify your own! Please be certain to enter the word or phrase desired in the option box above - choose your color preference - enter the quantity desired for that specific word/phrase - finally click on "Add to Cart." This process needs to be repeated for each unique word/phrase desired. Absolutely - Abundance - Acceptance - Action - Aloha - Always - Amends - Angel - Balance - Beauty - Believe - Blessed - Blessings - Bliss - Breathe - Bravery - Calm - Celebrate - Center - Change - Charity - Charm - Cherish - Choose - Clarity - Commitment - Community - Compassion - Competence - Confidence - Courage - Create - Creativity - Curiosity - Delight - Destiny - Devotion - Dignity - Diligence - Discipline - Discover - Do It - Dream - Empower - Endurance - Energy - Enjoy - Equality - Excellent - Excellence - Faith - Family - Focus - Forgive - Forever - Freedom - Friend - Fun - Glory - Grace - Gratitude - Growth - Guidance - Happiness - Harmony - Heal - Healing - Health - Help - Helpful - Honesty - Hope - Hopeful - Humility - Humor - Imagine - Inspire - Integrity - Journey - Joy - Joyful - Justice - Kindness - K.I.S.S - Knowledge - Laugh - Let Go - Let God - Liberty - Life - Light - Listen - Love - Loyalty - Magic - Mercy - Miracles - Mom - Mother - Mystery - Namaste - No Fear - Promise - Patience - Peace - Play - Pleasure - Power - Powerless - Praise - Pride - Process - Promise - Rebirth - Recovery - Rejoice - Relax - Release - Respect - Risk - Sanity - Serenity - Service - Silence - Sing - Sleep - Smile - Sober - Sobriety - Soul Mate - Spirit - Strength - Success - Support - Surrender - Survivor - Sweetheart - Tenacity - Thanks - Think - Trust - Truth - Try - Unity - Victory - Vision - Visualize - Vitality - Wealth - Willingness - Wisdom - Wish - Wonder - XOXO - Yes! ...or create your own word! A Vision for You - Be Here Now - Best Friends - Blessed Be - Came to Believe - Carpe Diem - Clean and Crazy - Clean and Serene - Clean and Sober - Easy Does It - Expect A Miracle - First Things First - Happy Birthday - I'm A Miracle - I'm Sorry - Inner Peace - It's a Girl - It's a Boy - It's a Process - Just Breathe - Just For Today - Keep It Simple - Let Go Let God - One Day at a Time - Peace on Earth - Pray for Peace - The Miracle is You - Thy Will Be Done - This Too Shall Pass- Trust The Process - Turn It Over - We Are One ...or create your own phrase! 96+ Word Stones - Save 65%! Love My Word Stone So Much! I received my Word Stone today, two days ahead of the expected delivery. This is my first order from the site and I'm very satisfied. It was well-packaged and the stone is beautiful! My stone is ice blue and has my first and middle name on it. This stone is perfect. It's even prettier than the display pictures. It's the first item I've ever had with my name on it (and I'm over 40, so it's a big deal to me). I bought it to celebrate my 3rd year of recovery. I recovered alone, no groups/meetings, so I buy my own tokens yearly. Thank you so much for a quality product and quality shipping. Your word stones continue to be great gifts for my sponsees! I love that I can order each with just the right word or phrase for the individuals receiving them. Always beautifully engraved, promptly shipped - just perfect! 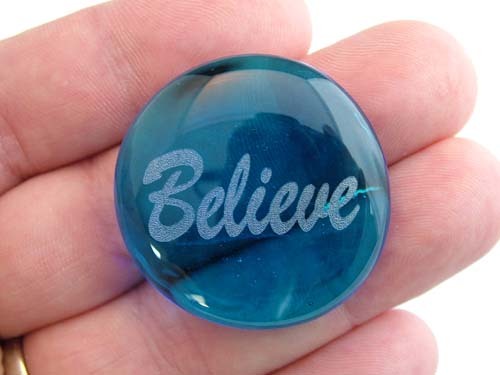 I bought two of these with the word "Trust" on them. One for my husband, and one for me, symbolizing my trust for him growing as he overcomes an addiction. They came incredibly fast (at my door in 3 days I believe), and look just like the picture! The price could not be beat especially with the quality of the stones. I also love how they keep you posted via email on your order status. Great product, great company! 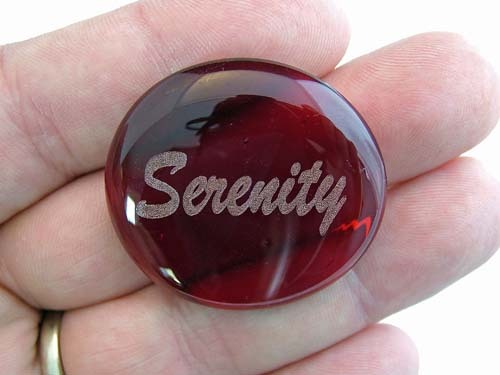 While there are other makers of these types of pocket stones, I find these to be, by far, the best! The laser engraving process that you use is superior to the silkscreening and printing common from other suppliers. 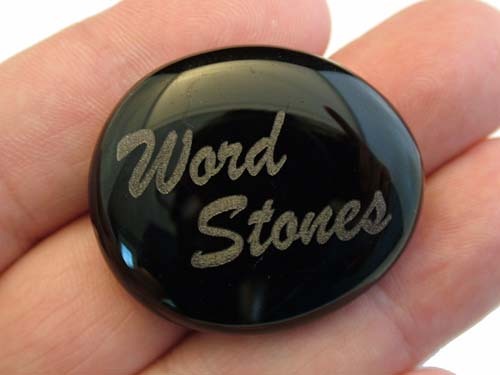 While slightly more expensive, your word stones are much better than your competitors! I got them today and Love them!!! Very happy with the product. I also like the speed and ease of ordering from you.